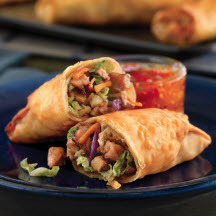 Serve these egg rolls when you want to offer an impressive and delicious appetizer. Don’t worry if your first egg roll doesn’t look perfect; you’ll master the easy technique after rolling a couple. Preheat the oven to 425°F (220°C). Spray a large baking pan with cooking spray. *Tip: Use leftovers from Roasted Pork Tenderloin with Asian Dry Rub. Calories: 100 calories; Protein: 9 grams; Fat: 1 grams; Sodium: 200 milligrams; Cholesterol: 20 milligrams; Saturated Fat: 0 grams; Carbohydrates: 14 grams; Fiber: 1 grams.